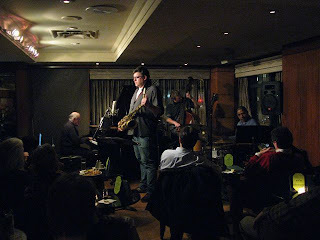 I didn't know these musicians before tonight, but I'll use almost any excuse to go to the jazz club at the Kitano New York Hotel. Stroll through the lobby, past the plump Botero sculpture (what's with Boteros and jazz? There are several Boteros in Time Warner Center, home of Jazz at Lincoln Center), up the stairs to the left, down the walkway, and you're in a jewelbox of a venue: low ceilings, comfy chairs, wood paneling, lighted glass cabinets with crystal on the shelves, and a corner with floor to ceiling windows. It's like hearing jazz in your living room, if your living room overlooks Park Avenue. 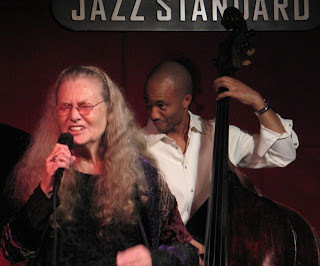 The schedule online said that Billy Hart would be the drummer, and that's a name I do know; I've seen Hart play several times, most recently in August last year at the Vanguard with Ethan Iverson, Ben Street, and Mark Turner. Turns out Hart was sick and Tony Jefferson stepped up, which may have caused some anxiety for Enders, who was doing a live CD recording (and who had played with Hart before; we're not sure about Jefferson). But everything sounded fine from where we sat at the bar drinking bourbon and sharing crepe cake (layers and layers of crepes with something sweet and creamy in between). 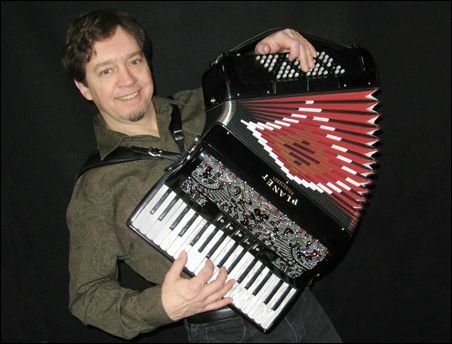 Born in Bavaria, Enders was billed as the "German sensation," and he played a good horn, surprisingly straight-ahead given his most recent CD, Ender's Room, a far more pop/electronic outing. The room was full, which I wasn't expecting given the night (Thursday) and the temperature (cold). Gino Moratti, who does the booking, told me that Kitano is finally catching on and you have to arrive early to get a table. That's good news. The other times I've been there (to see Tom Harrell, for example, and Lewis Nash) the crowd has been thin. Photos: Anders and Wind. The band and the room. Rick Germanson is a fine jazz pianist and a genuinely nice guy. 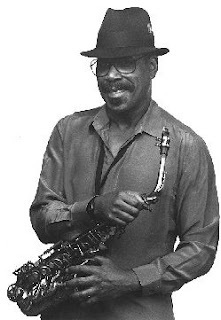 In addition to playing Manhattan clubs including Sweet Rhythm, Birdland, the Iridium, and Smalls, he tours Europe with people like Pat Martino, Wayne Escoffrey, and Regina Carter. Occasionally he comes our way for a weekend at the Artists' Quarter and to visit his parents in Milwaukee. He has a regular gig at Ruth's Chris Steakhouse on W. 51st street off 7th Ave. We're in the habit of finding out if he's there, then going to see him and having dinner at the bar. This time we heard some lovely Monk. 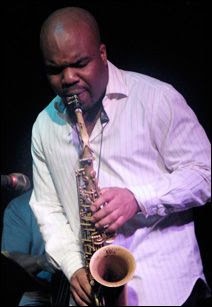 Rick has released two fine CDs as a leader, You Tell Me (2005) and Heights (2003), and has recorded as a sideman with Louis Hayes, Jeremy Pelt, Escoffrey, and others. He played piano for Carole Martin's Songs from My Heart, recorded live at the AQ. A CD of torch songs—"Going Back to Joe's," "Canadian Sunset," "Cry Me a River"—it's one of my favorites. Photo from Rick Germanson's Web site. 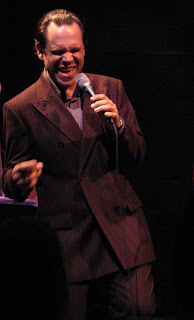 2/14/08: We're here for Valentine's Day, and to see Kurt Elling and Nancy King perform at the Allen Room. 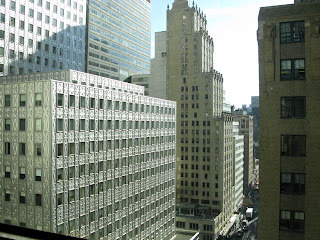 Thanks to my leetle sister, a Hyatt mogul, this is the view from our 21st-floor window at the Grand Hyatt New York in midtown Manhattan, adjacent to Grand Central Station. We're looking south down Lexington Avenue. If there was a window above our bed, we'd see the Chrysler Building next door. Friends are big fans of Tom Waits but I've never gotten into his music. I can't understand most of what he's saying/singing, and the tunes seem a bit too theatrical to me. (If it looks like a musical and walks like a musical, I usually run the other way.) But I realize Waits is a big singer/songwriter deal and I want to know more about him, so I keep trying. In 2001 (so long ago? ), we went to see John Hammond at the Cedar when he was on tour for "Wicked Grin," his CD of Tom Waits songs. Liked it! 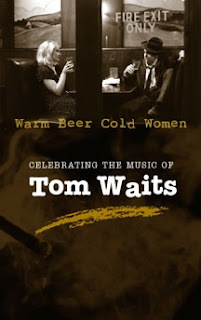 So when I heard about "Warm Beer Cold Women" (from an email sent by bass player Chris Bates) we decided to see that, too. It would not have killed the Dowling to shine a little more light on the stage; band members Bates et al. labored in the shadows for most of the show. But the music was interesting and there was a lot of it: 31 Waits songs, performed more-or-less chronologically, from beat-poet jazz to torch songs, circus songs, street songs, love songs. I was surprised at how beautiful some of the songs were; it helps when you can understand the words. I liked the singers—Hays, Curley, and Berdahl—very much. For some of the songs, they acted out mini-stories; for others, they stood there and sang; for one, Berdahl (who recently tore his Achilles tendon and had surgery to repair it) waved a crutch wound with Christmas lights. 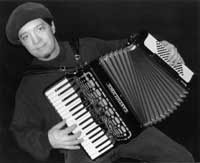 Chouinard played a greasy tango with a long-stemmed red rose between his teeth; when accordionist Mark Stillman first came on stage, he entered through a cloud of smoke and a rumble of thunder. It was the first time I'd seen an accordionist look menacing, and not, I hope, the last. Warm Beer Cold Women Web site. An all-acoustic, thoroughly satisfying show. This was my first time hearing Alexander live, though I often enjoy his CDs (Concrete Jungle, Impressions in Blue, Rocksteady, My America). The trio began with an original composition called (I think, but I'd rather be wrong) "Grub," then a gentle ballad called "Don't Go" before playing what many had come to hear: Alexander's jazz takes on tunes by his compatriot Bob Marley. We heard "Running Away" and a beautiful "No Woman No Cry," both from Stir It Up, Alexander's first Marley collection (1999). (Concrete Jungle came out in 2006.) "No Woman" began as solo piano, tender and comforting (baby, please don't cry), after which the bass picked up the melody. Later, a loose and easy "Little Darlin'" took an unexpected turn when Shakur's bass went pit-deep and growled. The encore was a little bit of everything that finally settled down into "Fly Me to the Moon." It was an evening of effortless swing, three fine musicians playing as one, three happy men on stage before a happy crowd. Don Berryman later said, "One word: Groovy. Okay, three more: In the pocket." 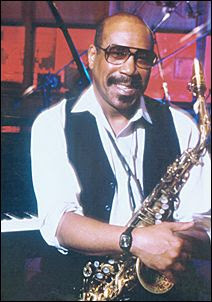 Jazz trivia: Hassan Shakur is the son of pianist Gerry Wiggins. Shakur also goes by (or has gone by) J.J. Wiggins, J.J. Hassan Shakur, and J.J. Hassan Shakur Wiggins. Photo by John Whiting. 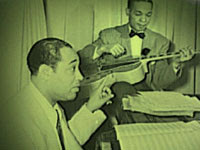 L to R: Fludas, Alexander, Shakur. Jean-Michel Pilc was born in Paris and moved to New York City in 1995. Glawischnig was born in Graz, Austria. He played with Ray Barretto, the son of Puerto Rican immigrants, and then with David Sanchez, who grew up in Puerto Rico. Glawischnig's exceptional new CD, Panorama, features Sanchez, Puerto Rican native Miguel Zenon, Luis Perdomo (born in Caracas, Venezuela), and Antonio Sanchez (Mexico City). 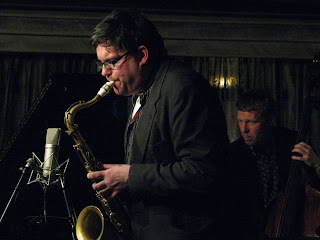 Hoenig has also been a member of Kenny Werner's trio with bassist Johannes Weidenmueller (Heidelberg, Germany). 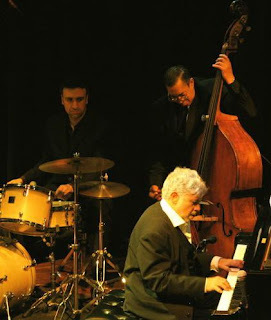 Tonight and tomorrow at the Dakota: Monty Alexander, born in Kingston, Jamaica. 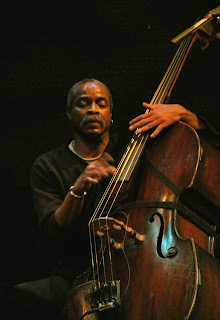 Last week: Toumani Diabate (Mali), Hugh Masakela (Johannesburg, South Africa). Coming up: NEA Jazz Master Randy Weston, who has spent much of his life in Africa. Pilc would not allow photographs, even by those of us with stealthy, silent cameras who never use flash, but that turned out not to be a problem. 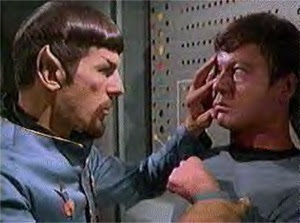 The Vulcan Mind Meld more than adequately describes the extraordinary mental communication that must exist between Hoenig and Pilc, given the way they play. I missed Hoenig and Pilc last year when they came to the AQ and have heard raves about them ever since. Still, I wasn't prepared for the experience of seeing them live. 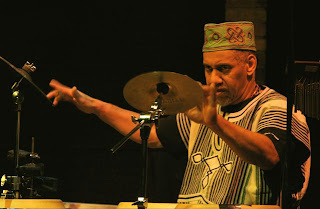 Hoenig plays the drum set as if it's a keyboard; using his elbows to tune the drums, he exacts actual notes from them, heard most clearly in their version of Nat Adderley's "Work Song." Pilc is a piano monster. He plays faster and larger (dense runs, thundering chords), with more imagination and wit, than many I've heard in a long while, and I hear a lot of pianists. They began with Pilc's arrangement of a Robert Schumann melody (lyrical, lush), then a Hoenig composition, "The Painter." After that came "Work Song" and Hoenig's astonishing performance, which framed fireworks and crashes from Pilc's piano. 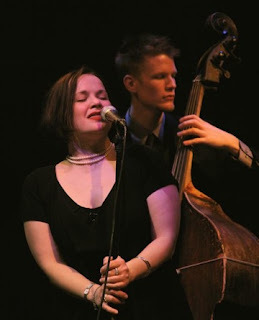 Glawischnig is a terrific bassist (I've seen him before with David Sanchez), but he seemed a bit conservative in the company of Pilc and Hoenig. I imagined our own Adam Linz on stage with those two. He'd fit right in. Next up, a version of "Giant Steps" that began with quotes from "Mission: Impossible," "The Pink Panther," and Mozart—red herrings all. It was during this piece (the single most interesting arrangement of the Coltrane classic I've ever heard) that I'm certain I saw brain waves pass between Pilc and Hoenig. Every move they made—changing keys, meters, moods—was made precisely together. It was uncanny. For the second set, we heard "Farewell," a composition by Hoenig, which Pilc began by plucking the strings of the piano. It could have been a Bad Plus piece written by Reid Anderson. We might have heard a quote from Monk, though with Pilc, a quote can be a gesture or a raised eyebrow. I was listening so intently I wished two of them would step back for while so I had the luxury of focusing on just one. The second set brought two lengthy pieces by Pilc: "Golden Key" and "Cardinal Points." Pilc whistled through much of the first tune. By this time, he could have done anything—burst into song, danced the tango, stood on his head and juggled pies with his feet—and I would have been happy. What a playful, brilliant, surprising night it was. 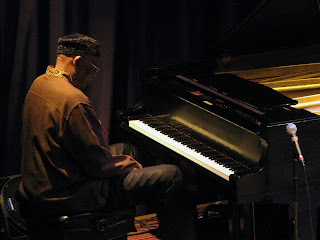 Maybe because I studied piano, I have a special affection for keyboard players: Bill Carrothers, Brad Mehldau, Keith Jarrett, Benny Green, Dave Brubeck, Bill Charlap, Herbie Hancock, Chucho Valdes, Gonzalo Rubalcaba, Danilo Perez, Cyrus Chestnut, Eliane Elias, Fred Hersch, McCoy Tyner, Geoff Keezer, Jason Moran, Jon Weber, Marcus Roberts, Rene Rosnes, Ethan Iverson.... These are all artists I've been privileged to see live, and I could go on. 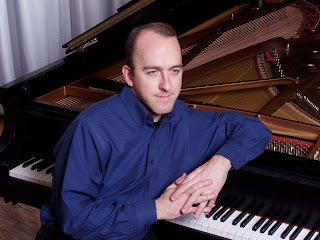 Around Minneapolis-St. Paul we have several superb pianists I enjoy: Phil Aaron, Tanner Taylor, Peter Schimke, Mary Louise Knutson, Laura Caviani, Chris Lomheim, Bryan Nichols, and I know I'm omitting more I should mention. 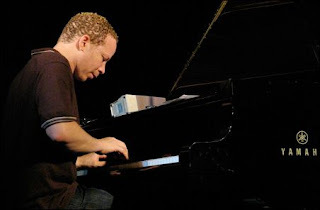 Craig Taborn, who grew up here but now makes the world his home, plays all the keyboards and spends most of his time on the outer edges of jazz. I find him endlessly interesting live and on recording. He's the topic of my MinnPost column this week. 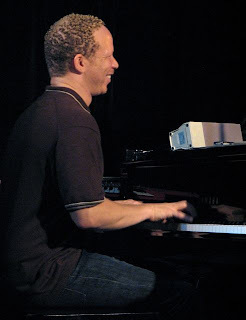 I did not interview Taborn for the article, but you can read a fairly recent interview on Splendid and hear clips from Junk Magic, his latest CD as a leader. Taborn tells the audience that Potter [saxophonist Chris Potter, who's in the audience] wants to hear “Little Red Machine,” so that’s where they begin. The music is complex, smart, and concentrated. Long passages become trancelike and hypnotic; there’s repetition, but repetition like a heartbeat; you don’t want it to stop. Taborn plays with a sense of fun (as the set winds down, he smiles frequently at the other members of his trio) and fierce intelligence. Following the tune he announces as their final piece, he nods and they segue into a lush, melodic, chord-filled version of Sun Ra’s “Love in Outer Space.” It’s breathtakingly beautiful and the perfect end to a music-filled night. Photo: Craig Taborn at the Monterey Jazz Festival, September, 2007. Monterey performance description from Jazz Police.